Bands such as Dimmu Borgir and Cradle of Filth skyrocketed in popularity due to their use of symphonic black metal and tying it into some darker and gothic tones. The act of complimenting the harsh and blast-ridden feeling of black metal and combining it with gothic-esque synths is far from a novel concept, with more bands using it to varying degrees today (see Carach Angren and Fleshgod Apocalypse as well). But many bands somehow lose the integration of brutality in their quest. 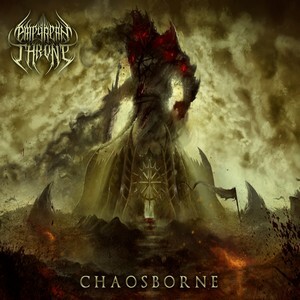 Not Empyrean Throne. Empyrean Throne may draw from the same pool as the acts mentioned above, but there’s a certain level of metallic abrasiveness and extreme influence that remains in their music that some bands bogged down with the symphonic elements tend to overlook. The black metal inspirations take the centerstage, augmented by the swirling and chaotic synths (“Sed Nomini Tuo Da Gloriam” for instance) and it makes for a nice blend of brutality and melody. That’s not to say that the two are always focused in the same light, with more atmosphere and orchestral/cello-based moments active in “The Devouring Mark” and more ritualistic venom of “Haereticus Stellarum Part II” playing off of the more brutal and caustic tones of “And None Shall Rise.” An album that’s conceptual in nature, telling the tale of “a hapless Templar knight in medieval Europe and his subsequent decent into the realm of Chaos” lends itself well to the band’s sound, and is given a more epic scope which can adequately feed off of the melodic and more brutal aspects of their material. A compelling album from beginning to end, Chaosborne uses the symphonic aspects of black metal but keeps a more snarling tone present to give themselves some distance from other like-minded acts. There’s just as many gripping riffs as there is orchestral atmosphere, which should bring in an audience that might otherwise avoid an album like this. Cinematic yet occasionally caustic.